For those looking to spice up their ho-hum sandwich experience may I suggest you turn to turkey? While many Canadians fantasize about feasting on roast turkey during Christmas and Thanksgiving, the festive birds squawk and bounce around farms year round. So whether you’re looking for a creative way to use up your leftover turkey after the holidays or keen to include turkey in your diet throughout the seasons…here’s a finger-licking-good and easy to prepare sandwich that will have you and yours delighted at dinner. It all starts with a high quality hamburger bun (I’ve used Ace Bakery) which I lightly slathered with mayonnaise and toasted in a frying pan until perfectly golden. 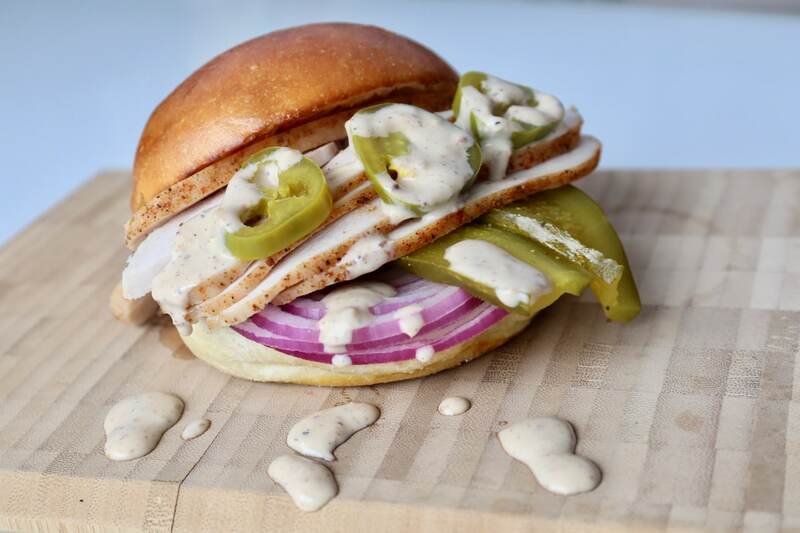 Build your sandwich by layering thinly sliced red onion, crunchy pickles, a generous portion of roast turkey, spicy pickled jalapeños, and then slather in a creamy homemade horseradish-forward white BBQ sauce.